The Big Squeeze: KS4 Curriculum – Breadth or Depth? Four ways to solve the big squeeze. The new GCSEs have forced us to think hard about our priorities and principles for the curriculum at KS4. Although we undertook an in-depth review of our model last year – as documented here – we are already looking to make some adjustments. In particular, as shown in the diagram, we’ve added an hour to Maths and taken it from PE. Although I resisted this initially, even though we’re effectively starting core GCSE courses in Year 9, it is now abundantly clear to me that Maths needs more time in Y10/11; 7 hrs a fortnight just isn’t enough for our students to tackle the volume of the new GCSE. However, taking time from PE doesn’t sit well. We’re going for three hour-long hits of PE instead of weekly two-hour hits; our view is that this will have more impact despite the time for changing. Why PE? No reason other than I couldn’t justify taking it from anywhere else, especially given the commitment we’ve made to PSHE. The other change is in relation to triple science. With Combined Science coming in September, we think that a) it is a sound basis for students to go onto A level on its own and that b) the volume of the separate science GCSEs will be too big to be delivered through extended day provision. So, we’re going to offer triple science as an option. Students can (and must) take humanities, languages and an arts subject alongside triple science if they choose it as an option; they will need to be in the same teaching set(s) for their core science. Our rationale is that we want each course to be taught in depth without trying to cut corners, limiting the experience to a relentless exam cramming course (which triple science can become.). I am aware that part of the pressure we’re putting on the core comes from our insistence on teaching a broad curriculum to all students through running four option blocks. This gives us scope to insist on Ebacc +Arts for all and still allow for students taking two humanities or two arts. In theory we could squeeze the time for these subjects down to four hours per cycle instead of five – but I don’t think that would be setting our students up to succeed. For comparison, when I was at KEGS, our KS4 looked liked the model above. We offered five options! This was done by squeezing the core even more with a shift between Year 10 and 11 as shown. Five options gave students huge flexibility – students could take two humanities, two arts and a language, for example. We were offering 12 GCSEs as a minimum with most taking extras – including the GCSE in MFL they took in Year 9. But that was KEGS. It worked in that context. We’d been sucked into a success profile based on maximising total points and that was hard to break away from. At another school I know, School X, they have put a three-option model in place as shown. This is the bare minimum Progress-8 structure for all students. Here, the priority is to give maximum time to each subject in the P8 framework at the expense of breadth. Students will get 8 GCSEs and a short-course in RE. They’ll be delivering the Ebacc so the third option is the only place for arts; this means, not everyone will take an arts subject if, for example, they want to do history and geography. No-one can do two arts subjects. On the plus side, every option gets three full hours per week – so they have time to deliver the courses in depth. There is merit in the simplicity of it even though breadth has been sacrificed. Significantly, a triple science option does not exist – that’s a casualty of the model. They are hoping the Combined Science GCSE negates the need for separate sciences. In trying to find the right balance we’re all trying to weigh up the value of exam results (more time giving a greater chance of success?) with the inherent value of breadth in the curriculum and the possibility of accommodating students’ different interests. I know some would dispute the validity of students having real preferences age 14. Arguably, if the whole curriculum was fully prescribed, students would just live with it. However, it’s clear that you can’t learn everything in depth – something has to give. My view is that our model provides a good balance of these competing priorities. Every element of the curriculum has room; nothing is squeezed out. At the same time, I admit that I am anxious that, in a few years’ time, the School X model might be seen as giving schools an advantage in the outcomes game and we’ll have backed the wrong horse – so to speak; if you ask me, it will be sad, if the narrowest curriculum becomes regarded as giving schools the best chance to win in the bell-curve contest. Hopefully, we’ll be on track for a win-win with more chances to get good grades from more options and stronger student motivation from making choices they’re happier with. Hopefully. Of course there is another option: a longer school day! But, with the current level of teacher workload already firmly at Maximum and the reality of declining school budgets, that’s just silly talk. Share your model via the comments to add to the discussion. I’m always interested in collecting models. My previous collection of models is now out of date but it would be good to re-run the exercise at some point. Our programme allows a small number of selected students to forgo the EBacc option block plus one other and take a ‘work skills’ programme which includes a work placement one day per week in Y11. Thanks Steve. Our models are very similar except that you have RE/Science taking one of our option slots. Glad to see you’ve got 5 hours for each option. Let’s hope that’s enough. Reducing PE ? Doesn’t fit well ? Have you really thought it through ? Holistic whole child, health ? Every school needs more not less ! Instead of? Suggest a full alternative model then I’m with you. Possibly stupid question – Why not have the third hour of the PE in an extended day? Would it impact on ECAs provision? Good post Tom. We just don’t think the new specs in the options subjects allow these to be done in 5 hours. As it is, Art is squeezed and ends up with kids doing it at all hours, Drama as well. We’ve gone similar to School X. We’re not making anyone do the EBacc. However, we’ve gone with 8 Maths, 9 English, 9 Science, 2 RE, 4 PE, 3×6 options, one of which MUST be either Triple Science (which is an option – the only one that depends on ability), history, geography, computing, or a language – this is a clear nod to Progress 8, though my personal belief is that all kids should take the Ebacc and we should have a longer day to ensure they have access to Arts. We agree with parents and teachers about the lack of breadth, but think that ensuring breadth but risking outcomes benefits no-one. I’m painfully aware that some (e.g.) technology subjects may not get enough to run, and we are looking at (also) extending the school day so that those that can cope with the increased content are able to keep breadth – but we will look at this when we’ve got the options and reserve choices in. Staff confronted with running a longer day or not having their subject run have generally said they’ll go for a longer day but we are keen not to take advantage of this and will pay it back elsewhere in the week and count it as their directed time. And we won’t make anyone do it. Extending the school day is far harder outside of London, where we have the twin problem of getting kids home as buses have gone and the terrible funding situation – running our Year 11 revision minibus between now and the end of exams at 5pm each evening is another £3.5k spent. It’s actually been a painful decision making process. The compromises have been difficult because there are a number of positions I agree with. Thanks for sharing your model. The problem I’ve found with extended day models is that you can’t get anywhere near the time needed. It works for the very top end just about as a cramming course but not as a substitute for a regular slot – and I can see how the transport costs will be a challenge. I can see School X 3-options models becoming the norm for lots of the reasons you’ve given. My problem with that is that isn’t a model many would design from first principles; there’s too much accountability pressure in there versus it being a product of considering what children should know and understand. As you say – tough compromises! Of course, ideally, if we had a system where Y13 was the key accountability point then we could think about it differently. I don’t think it is accountability driven. In fact, given all but two of our current year ten have a progress 8 compliant curriculum, and our ebacc pass rate is 51%, with 4×5 options it looks like we will have fewer take the ebacc because they are reluctant to drop all arts. Tough choices for them as well – so on one measure we’ll suffer by allowing all subjects that are taken more depth. However, given the average 20% more content, including in options subjects, I don’t think we can continue to expect pupils and teachers to squeeze that into current timings. There is an alternative – the three year ks4. But I really value the breadth of ks3 as I value what Hirsch writes about with the value of breadth of knowledge. The move to a three year ks4 really is a move for accountability – whereas I think the outcomes (in terms of knowledge) in subjects that pupils ‘drop’ at key stage three are valuable despite no accountability measure on them. It is the case that our local sixth form colleges, including one very prestigious one, ask for the grades to be high rather than there be more of them. That’s part of our driver. We do already run a period zero from 7.30 for those taking double languages, and will continue to. I agree with you that ad hoc extension of the school day (rather than a real structural change) is difficult to do properly. Interesting. I think high numbers of GCSEs will become the preserve of grammar schools from now on. They’ll be able to offer the range without worrying about the timing so much. I see the point about the volume factor. It’s a long time to wait to find out if we’ve got it right; my bias is to keep the breadth and hope that 5 or 6 hours isn’t going to be critical. Ebacc compulsion doesn’t seem to worry you which is good to see. We had Ebacc +Arts for all as an early commitment – but that would work with a three option system too. I can’t help thinking that the people who decided to put 20% extra in everywhere didn’t take much notice of the total package of GCSEs; it doesn’t seem like a deliberate policy to force people down the path to 8 GCSEs only – it feels like a perverse consequence which is annoying. Again, a factor of accountability at the wrong point in the system. I’m not sure kids need more than nine GCSEs, so I’m not so worried about that. What I am worried about is that I agree with the government that almost all kids should be entitled to the EBACC. I worry that the increased content is actually sort of squeezing the ebacc out. You can take the ebacc +art in our model, but you can’t take triple science – unless we do something after school. I don’t want kids to take the ebacc because of the performance measure, but because I think they are entitled to a broad academic curriculum. I don’t think there is a perfect model and without all specs being agreed, we are all trying to find an optimum model without perfect information. Without some of the freedoms on a longer school day that free schools genuinely have – we don’t for very good reasons of sticking with nationally agreed pay and conditions – we are all making compromises. As you say, it’ll be a couple of years before we know for sure if they were the right ones. We are essentially school x, however being a faith sponsored academy we have all students studying 5hrs RE. PHSE is only one period per fortnight & form time. 3hrs per fortnight PE. We will have three bands (hopefully moving to two bands in the future), EBacc band offered hums option, MFL option and one free choice (mix of arts, tech, sport, business, etc); Prog 8 band do one of hums or MFL/comp science, and two free choices. Final band have three free choices. Proportions will be roughly 45% on EBacc (currently at 21% in yr 11), 45% on Prog 8 and 10% on free (more vocational) choice. We have 3yr ks4. We made significant changes to options last year and met resistance from parents and students. I expect less this year. The challenge for us has been keeping non core subjects where we have traditionally strong results (and effective teachers) whilst needing to grow subjects where we haven’t. Of course students are less keen on selecting subjects where the teaching has been poor/inconsistent in their experience and explaining that EBacc comes from Russell Group unis has only limited traction in families with low aspirations. Our biggest work has been focused on improving the quality of recruitment (thankfully bucking the trend recently and finding strong teachers and middle leaders) and driving up teacher expectations and the challenge in lessons. Tom, apologies I said Stephen in my last message as he had retweeted the post! The only thing I’ve missed here is a side-issue: a concern that when we talk about ‘curriculum’, we automatically immediately talk about qualifications. It’s as if qualifications have become a proxy for talking about the curriculum. We have explicitly tried to avoid using the word ‘curriculum’ when talking about qualifications, and use the word curriculum when talking about what subjects pupils study in Key Stage 3, and what they study within those subjects. This is something I think is increasingly important if we are to value Key Stage 3 and its breadth as the right of every child. Very good point. We are probably a bit too sloppy with our language although PSHE is solidly part of our notion of KS4 curriculum. An interesting post and some interesting comments. As an independent school we have more flexibility than most, and whilst I’m not as critical of the Ebacc as most, we have nonetheless ignored it. Fundamentally I believe ‘arts” and ‘hums’ to be anachronistic and unnecessary categorizations – does history really have much in common with geography? – and as such should be discarded. 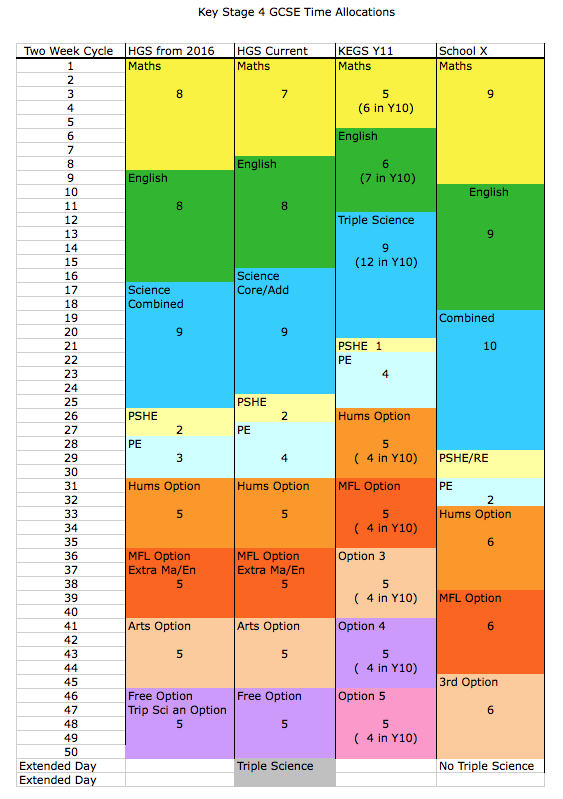 We provide 3 GCSE options with pretty much a free choice (interestingly most students end meeting the Ebacc criteria anyway) Which means our triple scientists obtain 9 GCSEs and our double 8 – which I think is ample, particularly as we timetable two periods of ‘enrichment’ which includes options as diverse as Mandarin and photography. All models are valid and are simply a matter of what the creator priroitises, the main thing in my opinion is that they are underpinned by a commitment to maximizing student outcomes rather than saving money/accommodating staff etc. We run 4 * 5PPF options with free choice, though one must be an EBACC subject or extra maths/English support (similar to another commenter’s school – it’s a P8 thing). We agonised over how to give maths more time (was 6PPF before) and ended up losing RE GCSE in the core. It was that or 3 options really. We considered reducing PE but decided it was good from a well-being point of view (participation is very high at our place). Thanks for sharing – interesting to compare! No twilights or after school. Our main concern is a lack of RE/Citizenship/PSCHEE in the t/t but we do cover these on drop-down days. Slightly a devil’s advocate question, but if you believe that Combined Science provides ‘a sound basis for students to go onto A level on its own’ (and beyond presumably) why offer triple science at all? Otherwise, aren’t you being slightly disingenuous? I guess it’s because some students love science and benefit from exploring the full content but won’t take all three at A level. Eg taking Physics GCSE but not taking Physics A level. Also, while our local 6th forms say they will not discriminate and grades are more important than the course (because some don’t offer triple) they are absolutely clear that triple is far better preparation for A-level. Combined Science is a sound basis. Triple Science for those with a real passion for Science. I would have no hesitation of not offering Triple Science within the normal curriculum. I’m a Science specialist. Does your 2016 Arts option include tech subjects? Yes. Food, graphics. Also media. Would love to see your KS3 model. Currently wrestling with how much time for MFL given that we can’t recruit quality teachers… Give it back to English? Current model is 30 x 50min periods per week. Maths 5, Eng 5 (all do Lang & Lit), Double Sci 7, RS or Cit 2 (vast majority do GCSE, teaching begins in Y9), PE 2, 3 Options each 3 periods. First option block Triple Sci, His, Geog, French or Spanish. Vast majority of students study 9 GCSEs – small number in DSP follow individualised curriculum.